Whether you’re looking for a wedding magician, or magician hire for an event or maybe even a stage cabaret magic show Steve has something just for you. Your Wedding is the most important day of your life, let your guests be impressed and entertained in equal measure by Steve-Wedding Magician with his stunning close up magic that will be talked about for years to come. 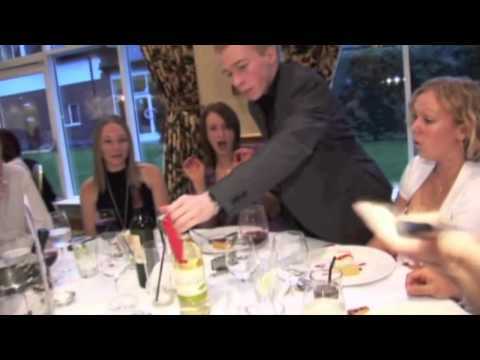 Table magic, is undoubtedly the perfect ice-breaker for your event. Steve is regularly asked by clients looking for magician hire to perform at high profile events using this form of magic and is regularly invited back. He uses his humour and performance style to suit your guests, and leaves your guests wanting more. A strolling magician is an unexpected gift for your guests. With Steve, you’re not getting just ‘any magician’ you’re getting an experienced ‘professional close up magician’, someone who will spread joy and laughter throughout the venue. This act can be up to 45 minutes but is flexible depending on your requirements and can be tailored to suit your needs. The show can be performed to small or large audiences, it’s a great way to lighten the mood and get everyone involved in this interactive show. A huge stage is not required.